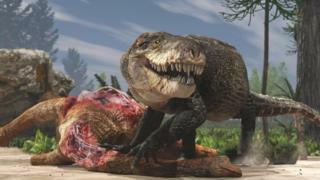 Researchers have described new fossils belonging to an extinct crocodile-like creature that had a set of serrated teeth like those of a T. rex. The animal was a top predator in Madagascar 170 million years ago, around the time dinosaurs roamed Earth. Its huge jaw and serrated teeth suggest that, like T. rex, it fed on hard animal tissue such as bone and tendon. It appears to be the earliest and biggest representative of a group of croc-like animals called Notosuchians. The animal's scientific name is Razanandrongobe sakalavae, which means "giant lizard ancestor from Sakalava region". This specialised predator differed from present-day crocodilians in having a distinct skull shape and powerful straight legs. In the open access journal, PeerJ, Cristiano Dal Sasso, Simone Maganuco and colleagues describe new bones from the skull of this massive crocodilian - which is nicknamed Razana. "Based on the preserved skull bones, we infer a body shape similar to that of baurusuchids [another type of Notosuchian from South America], and consequently an overall length of 7m - 1.6 m at the hips - and a weight of 800-1000 kg," Dr Dal Sasso, from the Natural History Museum in Milan, Italy, told BBC News. These dimensions are comparable to those of modern relatives of Razana: "As a matter of fact, an adult salt-water crocodile (Crocodylus porosus) can reach 7m in length and weigh up to one tonne," Dr Dal Sasso added. Previously, researchers didn't have enough fossil material to classify the species with confidence. But the new fossils allowed the Italian team to assign Razana to a group called mesoeucrocodylians - answering remaining questions about its relationship with other crocs. The study shows that Razana is by far the oldest representative of the Notosuchians, pre-dating other members of this group by 42 million years. "Like these and other gigantic crocs from the Cretaceous, 'Razana' could outcompete even theropod dinosaurs, at the top of the food chain", said Dr Dal Sasso. Indeed, the carnivore may even have fed on certain dinosaurs, which it shared the landscape with. Hi colleague, Simone Maganuco, also from the Natural History Museum in Milan, said: "Its geographic position during the period when Madagascar was separating from other landmasses is strongly suggestive of an endemic lineage." At the same time, he said, it represented a further signal that the Notosuchians originated in southern Gondwana - an ancient "super-continent" made up of Madagascar, Africa, South America, Australia and other present-day landmasses.